Mushroom Asparagus Risotto. Italian food is one of my favourite European cuisines, and I always have difficulty trying to choose between Pasta and Risotto. Always, Risotto tends to win my vote and the restaurant earns my monies. But, due to addition of wine and seasonings, it is impossible for me to order Risotto for my sons who are rice persons too. Apart from this reason, it is a bit boring to just serve rice and porridge to them every day. Probably they aren’t tired of the food but it’s me who is tired of just cooking these food. So, I decided to modify the Risotto recipe to make it suitable for my tots. Apart from mushroom and asparagus, I have tried cod fish with broccoli Risotto and they love it to bits. 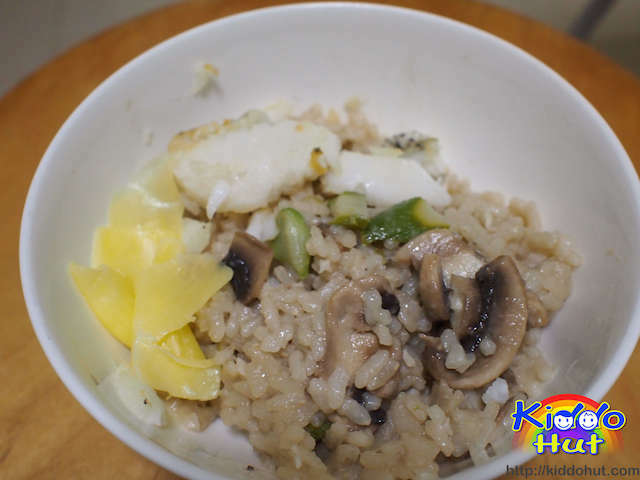 The cooking method is the same, just different ingredients and cooking time for the fish and vegetable to be added to the Risotto. In addition, I have included the ingredients for adults in this recipe as well. I usually cook Risotto for the whole family, then split the portion for my tots before adding the broth and seasoning, in order to cut down on the cooking time. I reduce salt and no wine (of course) for my tots. And, for my tots, I usually cook the rice softer than that for adults. One important note is, do not add the broth at one go. 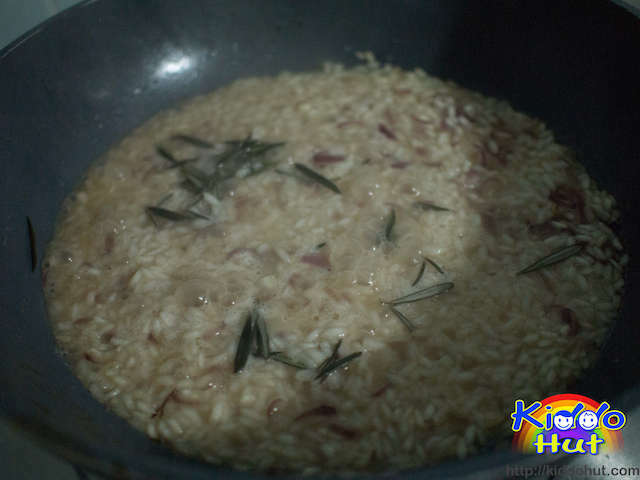 It should be added cup by cup to ensure the rice absorbs the broth and you can control the texture of the Risotto. Else, too much water may cause the Risotto to be soggy. To ensure the rice does not stick at the bottom of the pan, stir continuously. Also, different types of rice yield different textures. So, it voices down to preference. I have tried both Arborio and Carnaroli rice. Carnaroli is considered to be one of the best and more expensive variety as it is less likely to be overcooked. But, it is less creamy compared to Arborio variety which is shorter grain. 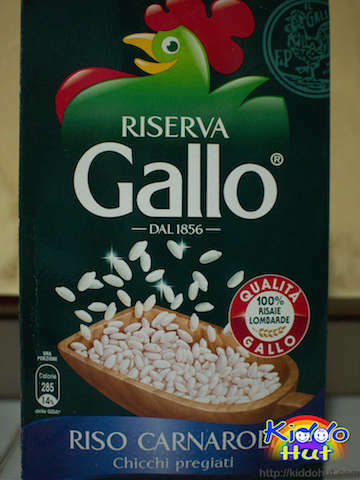 Personally, I like Arborio rice but the other family members prefer Carnaroli rice. Risotto should be served immediately after cooked, as it can become too dry with the grains too soft because it continues to cook in its own heat after taken off fire. 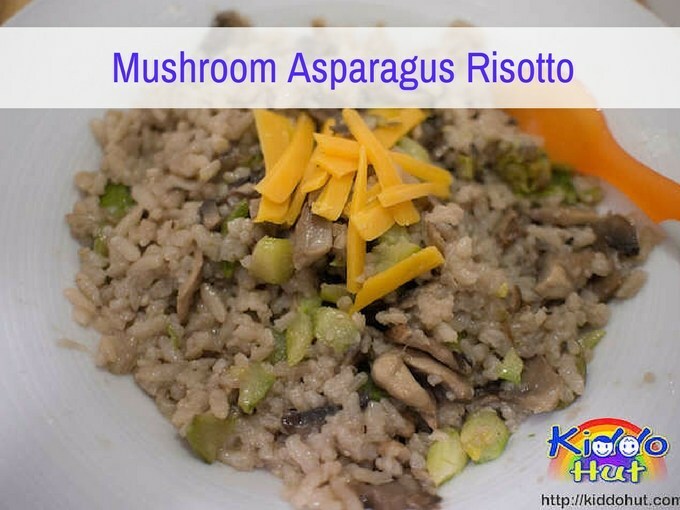 Let’s try this Mushroom Asparagus Risotto recipe! 1. Heat up 1 tablespoon of olive oil in pan, stir fry asparagus in high-medium heat. When asparagus is almost cooked, add portobello and white mushrooms and stir fry. 2. Once done, set aside mushroom / asparagus and its stock. Separate the stock from the vegetables for later use. 3. Heat up 2 tablespoon of olive oil in big non-stick pan/pot. Add in the shallots and stir fry until fragrant. 4. Add rice and stir fry to coat the rice with oil for 2-3 minutes. 5. Split the rice for adults and children, transfer the portion for children to another pan. I have apportioned 1/4 for my kids. 6. Add the white wine to the portion for adults. Stir until the wine is fully absorbed. 7. Add 1 cup of broth to the rice and cook under high-medium heat. Stir until the broth is absorbed. At the same time, add 1/2 cup of broth to the portion for kids and cook under high-medium heat. Stir until the broth is absorbed. 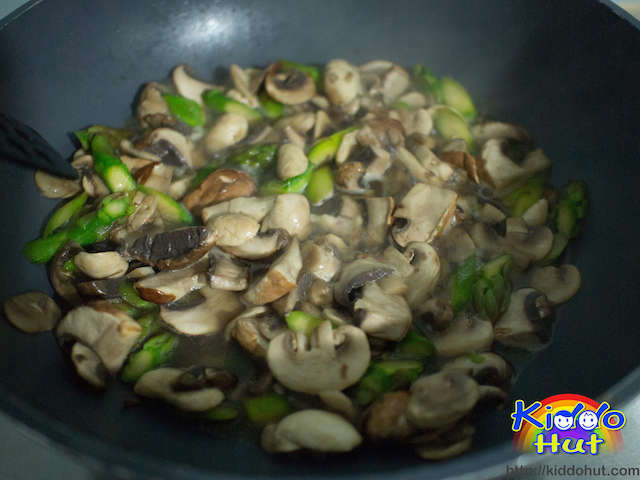 Remember to add the mushroom stock from the stir fry of mushroom and asparagus done earlier. 8. 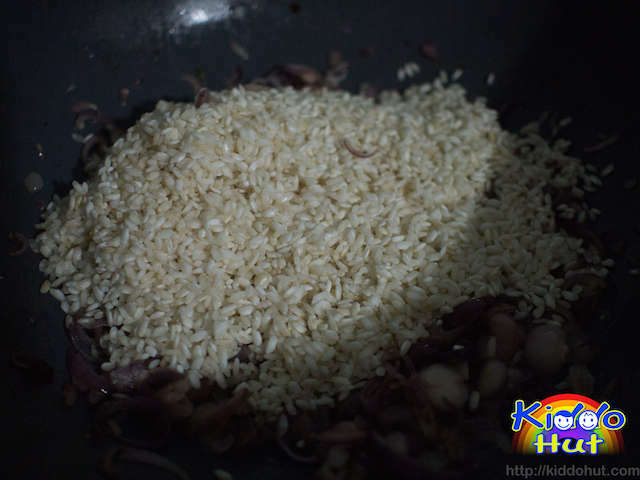 Continue step 7 until the rice is al dente. It takes approximately 20 – 25 minutes depending on the preference of texture. For my tots’ portion, I cooked for another 5 minutes to get the rice softer.